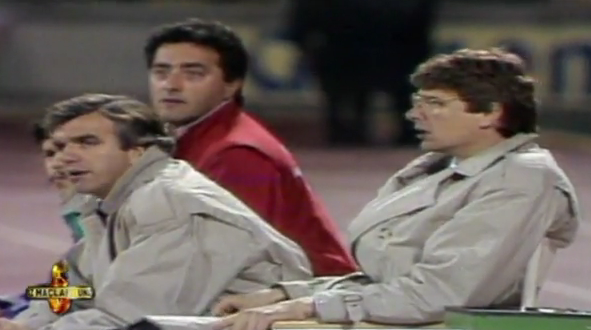 We continue our in-depth look at Arsène’s time with AS Monaco, after analysing the European Cup Quarter-final his side played against Galatasaray in 1989 earlier this week. That match ended in a 1-0 defeat, even with the firepower of George Weah and Glenn Hoddle on the pitch, in what was surely a formative experience for a much younger Wenger. The image of a frustrated Arsène Wenger on the sidelines echoes through the years, and although the context is different, and football has changed, that bespectacled visage still betrays the passionate and obsessive personality today as was clear 22 years ago. Wenger often cuts a frustrated figure on the sidelines today, water bottle moments included, and the case is no different here. The enigmatic nature of the man is notorious; as Mark Hateley said (in Jasper Rees’ biography) of Wenger “You’ll never figure him out” ; this mysticism still persists. 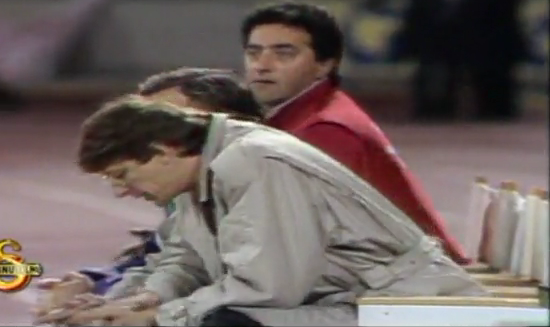 During the second leg of AS Monaco’s European Cup Quarter-final in 1989 Wenger cuts a frustrated figure on the bench. Twenty-two years ago Arsène Wenger’s AS Monaco were one of the best football sides in France. The manager, who had been relegated to Division 2 in 1987 at cash strapped AS Nancy-Lorraine, had led his new Monaco team to the French championship in 1988, winning Coach of the Year award and qualifying for the European Cup in the process. The following European campaign began inauspiciously in Iceland; a 1-0 defeat to giants Valur Reykjavík was attended by only 4,000. However Wenger recovered and led his side, including an in-form Glenn Hoddle and newly signed African starlet, George Weah to a Quarter final against Galatasaray, after destroying Club Brugge 6-1 in the preceding round, with Wenger signing Jose Touré in particularly stunning form.